Italian marble, exposed brick, rough concrete, and sleek wood mix with leather, feathers, Swarovski crystals, and fiber-optic fairy lights to give this relaxed boutique hotel a genuinely eclectic atmosphere. 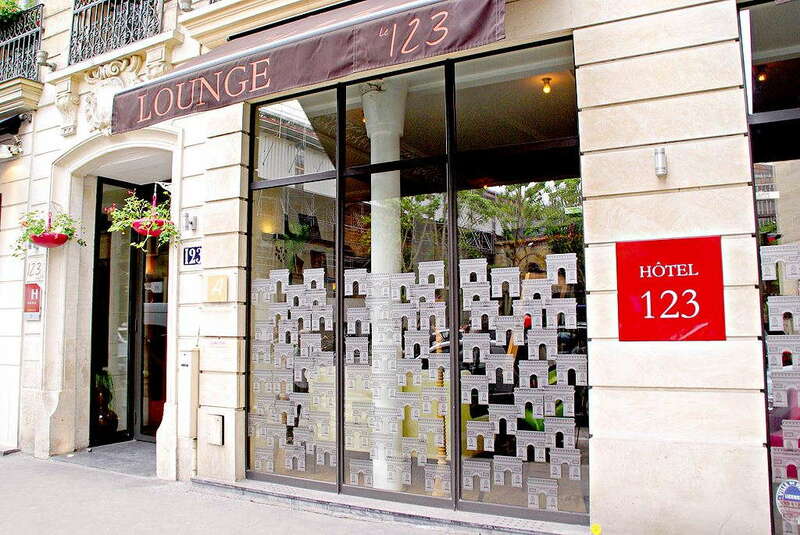 Conveniently located across from the métro station, the 123 gets extra points for being within walking distance to major sights and shopping in a prime location without the exorbitant prices—not to mention its unusually friendly and upbeat service. YOU SHOULD KNOW The hotel is on a fairly busy street and some noise can be detected in lower street-facing rooms. But you'll probably want an upper floor room for the views and balconies anyway. Pretty fabrics and framed prints evoke the couture culture of the posh Faubourg St-Honoré, but these bright white rooms' colorful accents and light wood floors lend a chic, airy atmosphere without any pretension or stuffiness. Complimentary soft drinks and water in the minibar and in-room tea and coffee-making facilities exemplify the hotel's wish to please. Upper-floor balconies have lovely views, from some you can even glimpse the Eiffel Tower. Roomy contemporary bathrooms, offering either a bath with hand-held shower or walk-in shower, feature retro fixtures, stylish mirrors, and some come with views from window that actually open. The small lobby, which encompasses a bar and breakfast room, is bright and cheerful, with a small reading area to peruse a selection of newspapers and magazines. Complementary snacks are offered throughout the day in the lobby's open bar (though no alcoholic beverages, sorry). A quality breakfast, including pastries and bread, smoked salmon, charcuterie and cheeses, eggs, cereal, and yogurt, is almost bountiful enough to last you the day. Be sure to see the "offers" section on the hotel website. Certain packages include a free breakfast as well as discounted room prices. A few minutes to the Saint-Philippe-du-Roule metro station, with direct service to the Eiffel Tower (Trocadéro), and a six-minute walk to the Franklin D. Roosevelt station, serving line no. 1, Paris's fast central line. 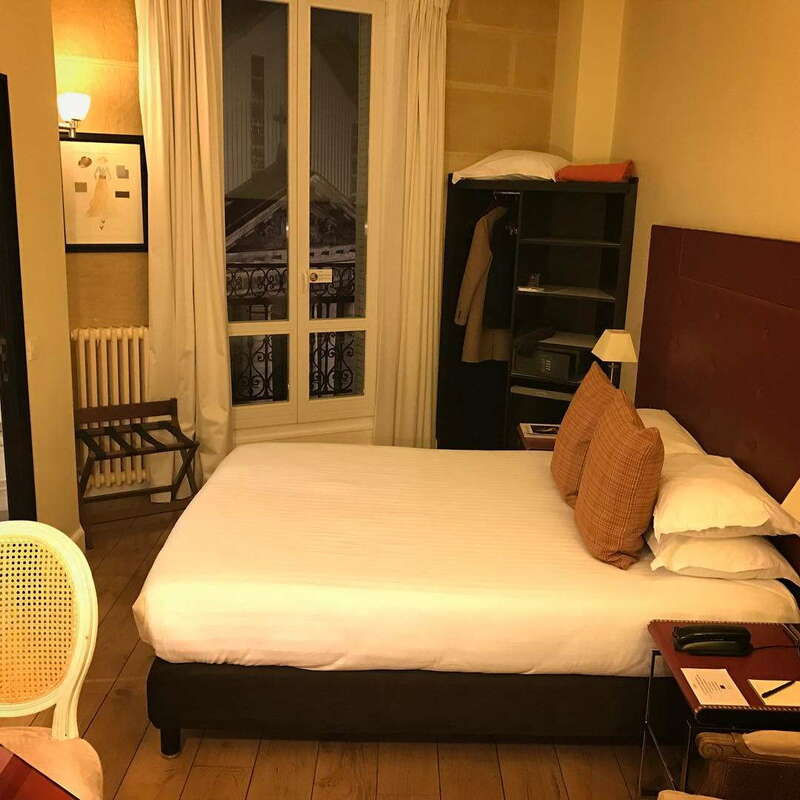 There are benefits to not being right on the Champs-Elysées, and this hotel is close enough to offer quick access to tourist sites and shopping while also benefitting from relative peace and quiet. If you don't already know Paris well, this is an area to discover. Toward the northwestern edge of the elegant Faubourg St-Honoré (the President of the Republic lives on this street), you'll find some lovely Haussmannian vistas and wonderful smaller museums well worth discovering, including the Musée Jacquemart-André, with a charming salon de thé for lunch or teatime, and the brand new Grand Musée de Parfum. 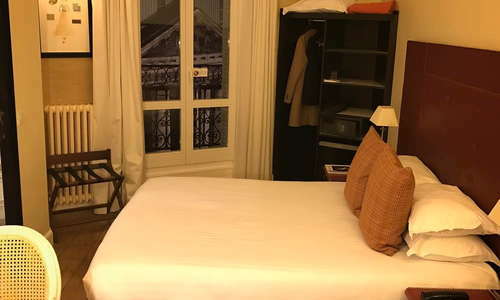 You're also within easy walking distance of the Petit Palais and Grand Palais, and, of course, elegant shopping on the Golden Triangle and rue Saint Honoré, the continuation of the Faubourg. 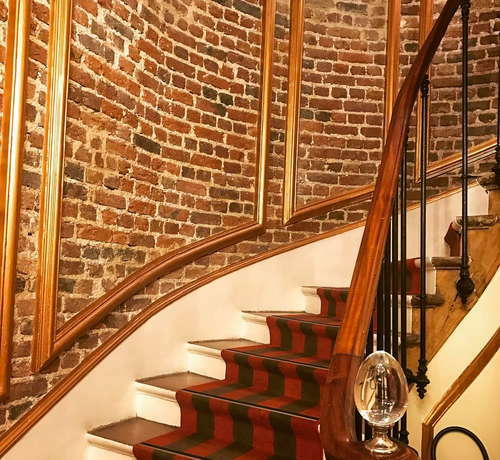 Some of Paris's great gastronomic restaurants are within a 5-15-minute walk away (many in other hotels), including Le George, at the Four Seasons George V Hotel, La Scène, at Prince des Galles, and Epicure at Le Bristol. If Epicure is beyond your budget—and for most mortals it is—its three-star chef Eric Frechon designed the menu at the Mini Palais (15 minutes by foot, at the Grand Palais) and its all-day and late-night hours and huge outdoor terrace make it a neighborhood favorite. For an excellent seafood plate, Helen, a small bistro within easy walking distance of the hotel, is one of the neighborhood's best spots for fresh aquatic delights with superb wines to match. In this pricey neighborhood, picking out a café that appeals to you and settling in for a glass of wine to watch the world go by is always a good option. But if it's a little nightlife and a good cocktail you're after there are a bunch of elegant hotel bars to explore. We love La Réserve and Les Heures at the Prince des Galles, both within a 10-minute walk—but Mini Palais, at the Grand Palais, is a great place for a cocktail, especially out on the terrace. 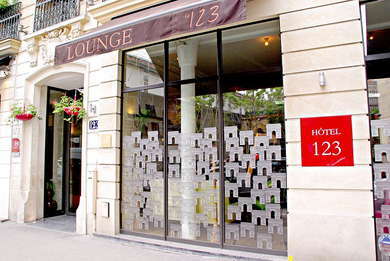 Bright, welcoming, and easy on the budget, this chain of 4-star hotels—it is one among five around Paris—goes out of its way to present an upbeat vibe and all the comforts, and services, that make your stay in Paris a memorable one.